HostFurious Review 2019: Is HostFurious a Good Hosting? Indian website hosting company HostFurious uses solid-state disk drives and has an uptime of 99.9% as well as 24/7 customer service. HostFurious is an Indian-based website hosting company that boasts a 99.9% uptime guarantee, 24/7 support, and a 21-day money-back guarantee. It’s not clear when they launched or how big they are, but it is clear that they do offer a good range of services including shared hosting and reseller hosting. Their website and support are available in English. HostFurious has a clean and easy-to-use website that advertises a selection of website hosting plans including five shared hosting plans, specialist WordPress plans, e-commerce plans, dedicated hosting, and reseller hosting. For beginners, HostFurious offers some good value-adds. Their shared hosting plan comes as standard with a search engine optimization (SEO) plugin and a website building tool with ready-made templates. Their one-click installer for 70 programs is a little bit limited when you consider that companies usually provide more than 300 programs. They also offer website migration and website setup assistance. For more advanced website owners and developers, their shared hosting packages offer a really impressive selection of features such as support for PHP 5 and many advanced coding languages such as Ruby on Rails, Perl, and Python. They offer SSH access, Cron jobs, and a CDN. Although they offer the aforementioned good selection of features for beginners and experts alike, the services are a little light when you dig into the details. Ideally, I’d like to see support for PHP 7.2 plus more programs available for one-click installation. Also, whilst they advertise a 99.9% uptime guarantee, this is not backed by an SLA. Despite being an Indian website hosting provider, it is interesting to see that HostFurious advertises its great prices in U.S. dollars as well as Indian rupees. Their very affordable base package includes 500 MB SSD disk space and 50 GB bandwidth, which could be just about enough for new website owners. The second cheapest package, with a much more usable 10 GB SSD disk space, is more than most everyday website owners will require. Contract lengths are twelve, twenty-four and thirty-six months. Although there is no month-to-month plan, they do offer a decent discount for committing to more than a year. You also get a generous 21-day money-back guarantee to help you manage your initial risk. Possible plan add-ons include off-site backup, an SSL certificate, and WordPress management. One free .in domain registration is included in all website plans. HostFurious provides excellent 24/7 support via telephone, email, and live chat. When I contacted them by live chat, they were very quick to respond and resolve my issue. My one small gripe is that while they do have a knowledge base, it appears to be empty. 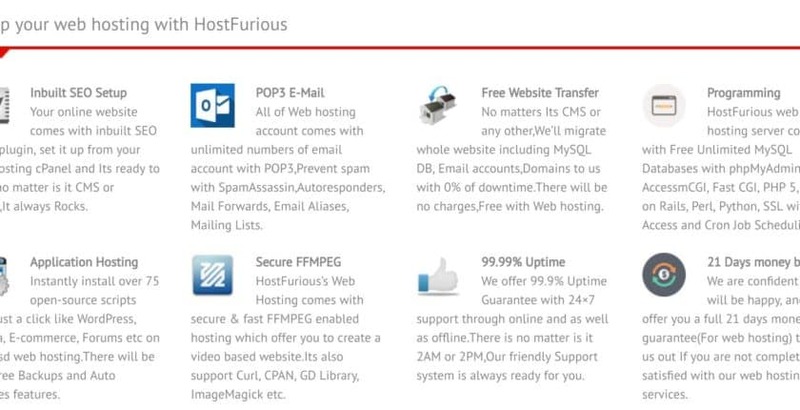 HostFurious offers a full suite of services. They offer packages and features suitable for both beginners and experts using Tier II data centers and solid state disk drives. Wondering how HostFurious stacks up against other Web Hosting companies? Enter any other Web Hosting company and we will give you a side-by-side comparison.